A Stir of Bones is a prequel to Nina Kiriki Hoffman's novels entitled, A Red Heart of Memories (1999) and Past the Size of Dreaming (2001). Set in the early 1980s, A Stir of Bones is about Susan, a young girl in middle school whose life is dictated by her strict and violent father, who abuses Susan's mother when Susan does anything that upsets her father. To stay out of her house as much as possible, Susan takes on school projects and visits the library often; when one day she overhears a group of kids her own age talking about a haunted house. Intrigued, Susan introduces herself to the group and joins them on their secret excursions to the haunted house. When Susan enters "House" (which is the name Susan assigns to the doting house that seems connected to her), she meets Nathan, a ghost of a young man that inhabits House whom she forms an adoring relationship with. In short, A Stir of Bones tells the story of a young girl willing to hide from her own, frightening family, to instead make her home with the ghostly apparition of Nathan and their House. I originally picked this book up hoping it would be a quick, spooky, and nostalgic read for the month of Halloween October; however, it took me over a month to finish. The prose was dry, and nothing about the way it was written made me feel connected to any of the characters; not even Susan. The highlights of the novel were reading about Susan's take on computers and video games in the 1980s, and parts of the story in which the House scares away outsiders aside from the group of Susan and her friends. The remainder of the novel was mainly comprised of stale dialogue between Susan and Nathan concerning how Susan feels safe and happy with House and Nathan and how she "wishes she could never leave," and so on. This book was overall extremely difficult for me to enjoy and I'm surprised I finished it. I have read A Fistful of Sky (2002) by Nina Kiriki Hoffman and moderately enjoyed it; however, I am not quite ready to write off Hoffman's other novels just yet. Hoffman has brilliant plot and story ideas, but it seems as if she hasn't mastered the ability to execute each story to its fullest potential. 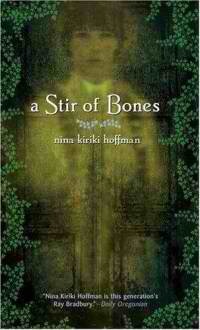 What are your favorite novels by Nina Kiriki Hoffman? Have you read her novels, and if so, what are your opinions?